A rubber joist mount specifically designed to support floor joists and provide drainage over membrane decking or concrete floors. Certified load capacity of 20881.63 kg. View the full load capacity (compression test) report here. Apply Holdfast Carbond 940 FC around each hole before inserting the nib of the DECK CHAIR joist mount. 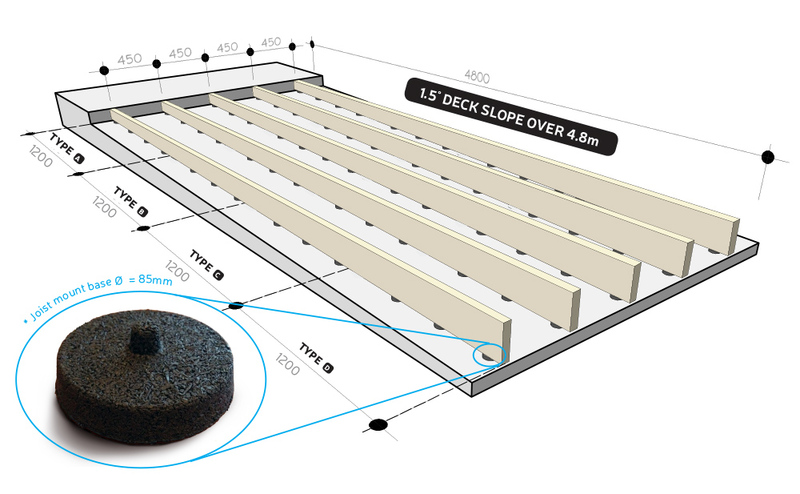 The rows of joists must not exceed 450mm centres, regardless of the type of decking. DECK CHAIR joist mounts provide support and drainage to deck joists. Installing DECK CHAIR joist mounts in any way outside of the specifications below voids all warrantees and claims. Ideal for timber joists on elevated concrete decks or concrete balconies.